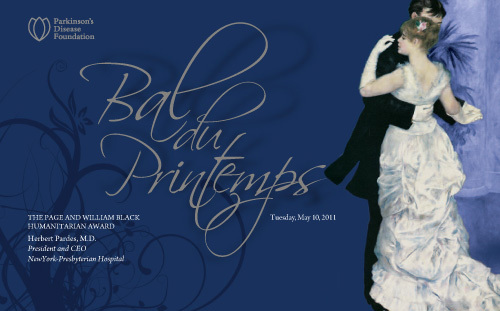 On Tuesday, May 10, 2011, the Parkinson’s Disease Foundation (PDF) will hold its annual Bal du Printemps Gala at The Pierre in New York City. Proceeds from the Gala will help PDF continue its vital work of funding promising scientific research. Ernie Anastos and Nick Gregory, Fox 5 News, will be the Master of Ceremonies for the evening. NewYork-Presbyterian Hospital, will receive the Page and William Black Humanitarian Award. John A. Thain, Chairman and CEO of CIT Group, is Dinner Chairman. Page Morton Black and Amy Goldman are the Honorary Gala Chairmen. Margo Catsimatidis, Jill Taub Drury, Stephanie Goldman-Pittel, Stevi Gurkoff, Karen Burke Goulandris, M.D., Ph.D., Isobel Robins Konecky and Arlene Levine are the Gala Co-Chairs. John K. Castle, John Catsimatidis and Alan C. Greenberg are the Corporate Co-Chairs. Stephen M. Ackerman, Howard DeWitt Morgan, Domna Stanton, Ph.D. and Sandra Feagan Stern, Ed.D are the Chairmen’s Committee. The black tie evening will begin with a cocktail reception at 6:30 p.m. followed by dinner and dancing at 7:30 p.m. Support levels are as follows: Tables at $100,000, $50,000, $25,000, $15,000, and $10,000; Tickets at $1,000. Page Morton Black, Chairman of the PDF Board and wife of the late William Black, founder of PDF. The Parkinson’s Disease Foundation is a leading national presence in Parkinson’s disease research, education and public advocacy. Created by William Black, the founder of Chock full o’Nuts, a successful New York coffee and restaurant business, PDF was the first national not-for-profit organization to focus on Parkinson’s disease. PDF is working for nearly one million people in the US living with Parkinson’s by funding promising scientific research and supporting people with Parkinson’s, their families and care partners through educational programs and services. Since its founding in 1957, PDF has dedicated over $85 million to fund the research of leading scientists throughout the world and over $34 million to support national education and advocacy initiatives. For Gala ticket information, contact Carla Capone at (212) 213-1166 or at pdf@carlacapone.com.